Twelve years have passed since the events of A Handful of Stars. Star continues to silently mourn Caleb’s death, World Builders, Inc. is completing its first asteroid-based Bernal sphere, and the Svensdotter twins are of a restless age. When the opportunity to undertake a survey mission of Mars’ Cydonia region presents itself, Star leaps at the chance. Drifting above Mars' surface, the family rediscovers the wonder of pure exploration. With strength and humor, Star addresses her parenting difficulties, battles 21st century piracy, connects with a self-sustaining Martian colony, and discovers a mysterious link with the red planet’s - and Earth’s - ancient past. In this concluding volume of the trilogy, Svensdotter comes to terms with the repercussions of The Big Lie and is forced to look back to Terra as well as out to the stars. 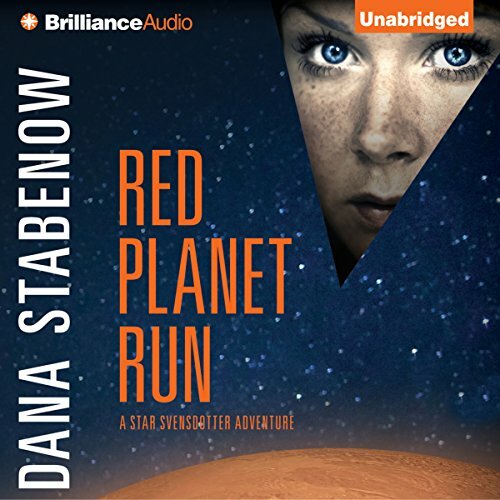 ©1995 Dana Stabenow (P)2012 Brilliance Audio, Inc.
again, see my other review of first in the series, 2nd Star. As i stated, there are nice elements and the beginnings of interesting ideas but what I would think would be earth shattering revelations seem to be ho hum and don't seem to drive much motivation. ultimately the series seems uncertain what it wants to be. certain scenes get belabored to the detriment of story pace and the development of the really interesting ideas. with reworking to remove cliche scifi elements and push the bigger ideas it could be good. i kept thinking of movie Prometheus and some of the Mars films of last decade and hoping this would get somewhere, but series kind of ends with a whimper.